Ok, got it and loved it. However, if you're looking for new pix, well....there weren't really many that I could classify as new--except for the family photos, which were excellent! I will say that the quality of the photos is tremendous! Very high quality! Some of my observations: I wish the article on page 61 was translated! Anyone? page 88: This is a letter to Sharon's grandma while she was on location. It's a sweet letter except I noticed that Sharon wasn't exactly terrific at grammar and spelling. She uses "there" instead of "they're" in reference to some clippings she's sending to grandma. "since 'there' my first but 'there' special....I 'wated' (should be "waited") so long...." It's a very sweet letter and shows her closeness to her family. Her grandma loved her striped cap from "The Wrecking Crew" so Sharon later obtained it and gave it to her. page 143: Ok, this is a totally new pic to me, I remember my mom using makeup mirrors like that! pages 68 and 158: She's wearing the same sweater in both pix, just different colors, same photo session. Of course, the color could've been changed by the photographer, but she also had this sweater in yellow so I'm guessing that she just really liked the style and bought a few of them! Now, let's do the math on something, ok? Sharon's winning baby pic, the "Tiny Tot" one...it's always been said that she won the prize at the age of 6 months. Ok. However, in the book, it has the photo and says she was 4 months old when it was taken. No big deal, I just figured that the photo didn't win until she was 6 months old, that Doris had sent it in right after she got it from the photographer. BUT! The award certificate is pictured in the book and it's dated April 27, 1943. Sharon was born in January so she would've only been 3 months old when the award was given out and probably only 2 months old when the photo was taken.. There's a photo of her with Max Baer from "The Beverly Hillbillies," taken on Aug. 1, 1963 and my first thought was '"she had 6 more years to live." Things like that will really jump out at you. I do recommend the book. Many of the comments are not new ones, but they're sweet. It's very clear that Sharon was loved! All in all, I really did enjoy the book and will definitely look at it over and over again. I enjoyed the fact that her death (and how she died) wasn't mentioned, this was just about her and that was wonderful. Even though it's been said that she and Patti had problems, Debra didn't omit her from the book. There are photos of her (including one that was also in another book but cropped out Debra) and she mentions her where it's applicable. She also dedicates the book to her entire immediate family. Debra did a nice job honoring her sister and I think she deserves the compliments and rave reviews that she's getting. I really did enjoy it and am wondering what others thought about it! Thanks Venus! I forgot all about that book. I've had home repairs to fix. Uggghhhh. If I have time tomorrow I'll got to B&N and see if they have it. You're SOOO much like me. Mis-spelled words and typos stick out like sore thumbs to me. As far as Debra & Patti having problems, as far as I know, it was only brought up by "another author". I've never seen it mentioned by Patti or Debra at all. I looked through a copy at the bookstore. I enjoyed her father's investigating. There's a story of him following some bikers from Cielo to Spahn that I found especially interesting. Loved all your impressions of the book, Venus. ^Not Page 88, Page 61. I loved the book and think Venus gives a very fair review. I don't see the same sweater on pages 68 & 158 so I'm not sure what's going on there ( or am I really missing something, it wouldn't be the first time) As far as the baby picture goes I've wondered about that before, it's been posted elsewhere as the picture Doris sent in when Sharon won Miss Tiny Tot but Doris describes her wearing a white dress and black patent shoes. It's hard to tell the color of the dress with the fading but I don't see the black shoes. I'm not sure what's going on there but Sharon was obviously a beautiful baby regardless.I too had seen most, though not all,of the pictures but I think the purpose of the book wasn't to show new pictures but to remember Sharon and Debra Tate did a nice job of it. She did a nice of of remembering her whole family actually and I'm happy- especially for Sharon's memory that so many people seem to love the book. Carol, there's an article from a magazine that I'd love to ahve translated. Yes, Krissy, look closely at the sweater, it's the same one! (I'm weird about noticing things like that, LOL) And, yes, I noticed the comment about the black patent shoes too and she's clearly wearing some little soft white baby shoes in the photo. I agree with your last sentence. Revatron, this isn't the same book, you're thinking of "another" one. More observations: In the pony pic on page 13, notice the woman (probably Doris) holding onto baby Sharon. She's trying to hide, but you can see her. Doris, page 17, great legs and great figure! Woo-hoo, Doris! page 19: comment from Sharon about how her dad had a curfew for her and her sister (when Sharon was of dating age, her sisters would've been too young to date,) she also said that he often vetoed their choices of boyfriends. I'm going to assume that this interview might've been made towards the late 60's when Debra was of dating age?? pages 35 and 44: Sharon wore the same dress in her beauty contest win in Washington and as Queen of the Prom in Italy. page 59: Notice her ankh necklace? I wonder if Jay gave it to her! page 109, I LOVE this pic! pages 139-141, wardrobe malfunction! Ouch! page 142: Sharon started the ombre hair trend! page 191: I LOVE this pic! My Barnes & Noble doesn't have the book yet. My library doesn't know if it can get it! Great Review! Very Specific. I plan to pick it up very soon. I liked the last part best and would ask if you could expand on that for a bit? Did this have any similar kind of effect on you? I have read quite often that Deb is always trying to be in the middle of all things associated with the case, and heard every move she makes called an attention grab more or less. 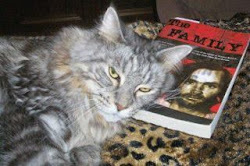 Venus- do you feel this book was in any way anything less than a really nice tribute her sister and family?? Or- I guess what I am asking is- Did it- in any way- have the feel of yet another attempt by a peripheral player to "cash in" ??? Hi St! Good to see you! Krissy, yes, I have the hardcover so I guess the pages might be a bit off in another version?? The sweater is a white (or cream) one in the gallery of pix from her MGM days, then it's a pale blue in the other photo which is a magazine cover (it's on the far left side, in my copy, if that helps!) She also had it in yellow, she wore it with a black leather miniskirt. She also wore the same sweater with a pair of patterned (herringbone?) pants when she was kneeling on the floor. I always figured that sweater must've been the yellow one, but now I have no idea! Carol, see if your library can order from out of your district. Mine can. It's worth a try. Saint C, I also loved "RS, at first! Then I started thinking it over and now I'm like "meh" at it. It's ok, but that's about it. If we'd actually heard from their own words what the family felt instead of having it all sort of recreated, (for instance, I would've loved to have read PJ's entire manuscript instead of just a smidgen of it) that might've made a difference. The fact that Debra was basically not even mentioned was ridiculous. I know that Debra gets a bad rep in many ways. My only gripe is how her stories change such as where she was when she heard about Sharon's murder. How could you forget something like that? But I digress. In this case, I give Debra a huge thumbs-up. I think it definitely was done to honor her sister and not cash in, although I'm sure she's getting paid for her TV appearances and so on. I think she definitely did a good thing, this book is great. The only things that were new to me were some of the magazine cover photos and, of course, the family photos, but the quality of the other photos is amazing! Venus, I also have the hardcover but obviously some of the pages are different for whatever reason. Regardless, yes now I know what sweater you were referring to and she did indeed have it in different colors. She must have stuck with the styles and clothes she liked quite often ( which is a good trait to have!) I know she had a dress made in several different colors because Roman told her he liked her in the first one. This was told by Mia Farrow on a television show some time ago and I had noticed the dresses before that. Even after you pointed out that Doris was in the pony picture on page thirteen it still took me a minute to find her-great eye! Sharon was a very pretty child but I think you can see the beauty she was to become really start appearing at about age ten. By thirteen she was already quite stunning-IMO anyway. I pity the poor girls who were up against her for pageants, Prom Queen, etc. Although they are all pretty in their own right her looks obviously stood out. I wouldn’t have wanted her to be my competition in anything to do with physical beauty. A couple other observations- Sharon and Debra both have the same stripes on their outfit on page 26- cute touch. It’s easy to see why Sharon would have been so important to both of her sisters and what a loss it must have been for the entire family. One other observation- I love the picture on page 95- she’s jumping in the air on the set of Eye of the Devil and in my book it looks like her zipper is breaking! Not sure if it actually was but it sure looks like it. That’s a great picture IMO anyway. I also really liked the one with Sharon ( in braids) and Roman standing next to Debra on her horse. I wish there were more from that day. It’s been a lot of fun looking through this book- I wish it were longer! I've seen pictures of Debra at the book signings on other sites. She looks fantastic - beautiful red hair, great makeup, perfect teeth like Sharon. But I think she's has some work done because she has lost some of the Tate family "look." Not that I blame her. We're the same age and I wish I had the money to have some work done! I've read some reviews that are critical of the fact that it seems Debra, according to the book, was there for every major event in Sharon's life. As if Debra inserted herself. I was a fan of Sharon while she was still alive and I remember reading, after the murders, that despite the age difference Sharon was very close to Debra. So I can see Debra being there with Sharon at important times in Sharon's life. Except for Sharon and Roman's wedding, when none of the Tates attended. I will never understand that. But I digress...Venus, did you think that Debra "inserted" herself too much in Sharon's life in this book? Thank you for the review of Debra's book. Based off what you said I will get it. It is wonderful that Debra included her entire family and one wonders if Patti had been alive if she would have allowed her sister Debra to have been omitted in her book. And those that trash Debra should understand that Sharon Tate would surely be sad to see such horrible things written about Debra. As Saint C says, the earlier book does bring the Tate family struggles out in a very public way. Like Saint, I have issues with that book but I do appreciate certain aspects of it. And of course, an author makes their own choices and we now have two books from the Tate family to consider. Two different authors and each book will stand/fall on its own merits. Overtime, I wonder which one will be considered the better one within the TLB Community. Since I bought Restless Souls I definitely need to get Debra's book. Thank you Venus. So far as "I wish the article on page 61 was translated! ", there is a feature online I sometimes use called "Google Translate". You type in the foreign language you don't understand, and it translates it to English. It's free, easy, and you don't have to download anything. The bad news is it's usually not very accurate, however it usually gives you some idea of what the text says, (not always though). Sunset, the article is in such small print that I can barely read it. If someone with better vision can get it translated, I'd be most appreciative. Excellent points, Johnny, and you're welcome! Krissy, I wonder why our pages are so different?? Saint C, you said that you "liked the last part best" and wondered if I "could expand on that for a bit." Since I'd posted twice, what exactly would you like me to expand on? I'd be happy to do it! Ok, thanks for explaining! I didn't want to not answer you!